A renowned belt conveyor technology specialist has become the sole distributor of the acclaimed CleanScrape Cleaner. Martin Engineering GmbH has taken exclusive responsibility for sales in all of Europe as well as in Russia, North Africa and the Middle East. The innovative belt cleaning system received the Australian Bulk Handling Award in the ‘Innovative Technology’ category in 2013 for its design and potential benefits, which include low belt wear, extended service life, reduced maintenance and improved safety, ultimately delivering lower cost of ownership. It has been proving itself in a wide range of applications, such as mining, coal handling, quarrying, cement, scrap and other material bulk handling operations. 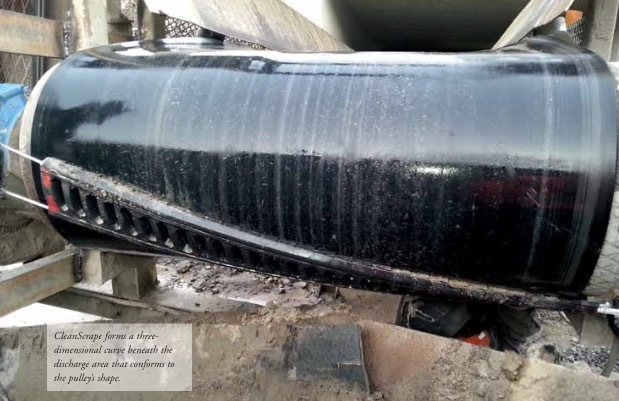 Unlike conventional belt cleaners that are mounted at a 90° angle to the belt, the CleanScrape cleaner is installed diagonally across the discharge pulley, forming a three-dimensional curve beneath the discharge area that conforms to the pulley’s shape. The unique design incorporates a matrix of tungsten carbide scrapers and is tensioned lightly against the belt to prevent damage to the belt or splices. Despite extremely low contact pressure between belt and cleaner, it has been shown to remove as much as 95% of potential carryback material. The novel approach has been so effective that in many operations, previously crucial secondary belt cleaners have become unnecessary, saving further on belt cleaning costs and maintenance time. The CleanScrape Cleaner protects the belt with its specific application of low force and is ideally suited for both slow and fast conveyor belts, including those with mechanical splices. With its compact size, the design is an excellent solution for areas with restricted space. It can be located either inside or outside of the transfer chute, and the straightforward installation typically requires less than two hours. CleanScrape cleaners are generally sold in three sizes: S, M, and L, which cover drum diameters from 270mm to 1,250mm (10.6” to 49.2”) and belt widths from 300mm to 2,800mm (11.8” to 110.2”). Each size is available in four different carbide metal grades to suit specific materials and belt structures, one of which is a carbide formulation developed for use on mechanically spliced belts. The supporting components of the assembly can be specified in regular steel or in stainless for specialized applications. All of the CleanScrape cleaner designs are certified by ATEX and can be used in underground mining. In addition to the pre- assembled belt cleaners that are ready for installation, the units can also be supplied in coiled lengths of 12.4 metres (40.68 feet), allowing users to cut to length as needed. Necessary equipment and accessories, such as chains or steel cables, can also be obtained from Martin Engineering by the metre. CleanScrape GmbH was founded in 2014 to supply and further develop conveyor belt cleaning technology. The business emerged from the company IBS Industriemaschinen-Bergbau- Service GmbH, which has been active for more than 30 years in mining, tunnel construction and conveyor technology. IBS and CleanScrape are a part of Schmittgruppe, a fourth-generation, family-run business with headquarters in the northern Bavarian town of Bischofsheim an der Rho¨n. The group operates as a supplier for the automotive, aviation and power generation industries, mining and tunnel construction, the bulk materials industry and other sectors. With around 220 employees, the business group has a branch in Poland, as well as partnerships with distribution companies and service firms worldwide. The company is certified according to DIN EN ISO 9001:2008. Martin Engineering was founded in 1944, and has grown to become renowned worldwide for its expertise in making bulk materials handling cleaner, safer and more productive. The company supplies conveyor products and material flow aids around the world for a wide variety of bulk material applications, including mining and coal handling, quarrying, cement, rock/aggregate, biomass, grain and other materials. The firm is headquartered in Neponset, IL (USA), offering manufacturing, sales and service from factory-owned business units in Brazil, China, France, Germany, Indonesia, Mexico, South Africa,Turkey, India and the UK, and under exclusive licence with ESS Australia. The European Headquarters was founded in 1987 as Martin Engineering GmbH and is based in Walluf, Germany, near Wiesbaden.